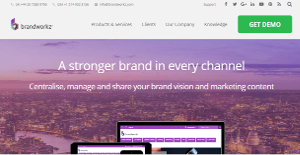 Brandworkz is a flexible and configurable digital asset management software. It serves as a creative team’s content storage system as well as their central work hub. With Brandworkz, creative organizations can centralize, manage, and distribute their marketing-approved assets to multiple channels from a single platform. Brandworkz DAM users especially appreciate the solution’s ability to assist them in managing a huge bulk of media assets. It not only smoothens a team’s workflow, it also saves agencies time and money. This solution also integrates with the more popular marketing applications to assist companies in automating content editing and sharing. Furthermore, the software is available across different platforms. This enables dispersed team members to create media and managers to supervise their coworkers even while they are away from their desks. With Brandworkz DAM, creative agencies have a central repository of all their valuable media assets. The solution allows them to proficiently manage the enormous volume of assets and direct them for use in multiple digital channels. This streamlines their work and affords them more time to focus on creating rather than in managing. Having a digital storage system in the cloud makes retrieval more stress-free. This provides flexibility for team members who work away from the office as they are able to access the relevant content securely and rapidly. This way, they are able to swiftly push projects for approval and eventual publication for marketing campaigns. Brandworkz DAM ensures that creative agencies always have the most up-to-date content within their reach. This is made possible by the software’s asset versioning function. It enables content producers to use the latest version of the asset they need for a more consistent branding of visual communication. Brandworkz provides creative teams the ability to share content to members expeditiously. The solution’s drag-and-drop functionality allows users to immediately upload files within one folder to expedite the sharing process. This leads to faster distribution times when it comes to pushing marketing content to various promotional channels. Faster uploads means faster content creation and quicker market engagement. Brandworkz affords creative organizations the power to customize the software according to their needs. The solution has a high level of configurability that allows users to structure the site, create their own folder taxonomy, customize metadata, bring together user groups, and more. It gives users more comfort as they can work with a solution that adapts to their needs rather than them adopting to its structure. With familiar structures, they can perform tasks faster and save the company time and even leverage their marketing by pushing ahead of the competition. If you are considering Brandworkz it might also be sensible to check out other subcategories of Best Digital Asset Management Software listed in our base of SaaS software reviews. Since each organization has unique business needs, it is advisable for them to abstain from seeking a one-size-fits-all faultless software system. Needless to say, it would be pointless to try to find such an app even among popular software applications. The intelligent thing to do would be to jot down the various vital elements that require consideration such as main features, finances, skill levels of staff members, company size etc. Then, you should do your homework thoroughly. Read some Brandworkz reviews and investigate each of the other solutions in your shortlist in detail. Such comprehensive research can make sure you weed out ill-fitting applications and choose the system that offers all the elements you need for business success. How Much Does Brandworkz Cost? Customers who subscribe to Brandworkz are assured that they will have the utmost control over the software. It adapts to a company’s needs and is highly configurable to fluidly assimilate into an organization’s existing work processes. Enterprise pricing for the solution is not available on the website, and interested businesses have to request a demo and get in touch with Brandworkz’ sales team. We realize that when you make a decision to buy Digital Asset Management Software it’s important not only to see how experts evaluate it in their reviews, but also to find out if the real people and companies that buy it are actually satisfied with the product. That’s why we’ve created our behavior-based Customer Satisfaction Algorithm™ that gathers customer reviews, comments and Brandworkz reviews across a wide range of social media sites. The data is then presented in an easy to digest form showing how many people had positive and negative experience with Brandworkz. With that information at hand you should be equipped to make an informed buying decision that you won’t regret. What are Brandworkz pricing details? What integrations are available for Brandworkz?